You knew that I couldn't leave Fred all alone, didn't you? Meet Flora. 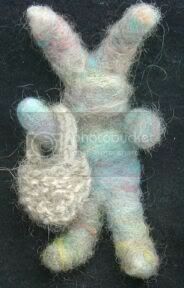 Like Fred, she is needlefelted (over an armature of pipe cleaners). She stands about five inches tall. 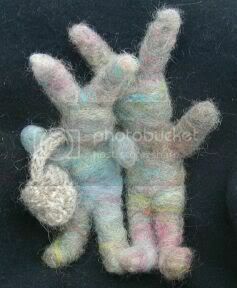 And she has a lovely hand knit basket, that will soon sport some teeny tiny Easter eggs. Given how rabbits are known to behave, I'm sure that you can guess what might be arriving soon after that. Don't they make a cute couple? God, I've got to get a life.